The choice of methodology for developing information systems today deals with many issues: you should think about dealing with Business Process and Information System Reengineering, Enterprise Strategic Information Warehouse and Decision Support, Intranet and WWW Application Development, Utilization of Legacy Systems, Workflow Management, and more. All these areas of activity must be based on a unified information model of underlying business processes. Achieving this level of agility requires business process applications and a technology infrastructure that can support rapid and frequent changes without disrupting business operations. Moreover, a real context produces a large amount of information and documentation that must be shared and controlled. 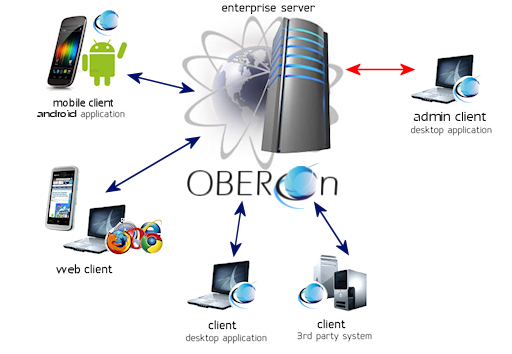 OBEROn implements a Business Object Architecture and provides powerful tools for managing Business Objects and related information flows. - the Model is a system of Business Objects, such as Financial, Production Management, etc. - Process represents an activity, such as purchasing, approval or production. In business modeling, a Business Object describes a concept of the real-world that must be modeled (entities, processes, events). Business objects may have methods, rules, states as ways to describe the actions that can be performed with them. As business objects encapsulate their internal behavior, integrated behavior of system of business objects is ensured via an Event-Rule-Action model. The fundamental business object modeling constructs are rules and roles. The rules represent things that must be done or validated when any action is taken by or any change occurs. The Rules are not limited to individual objects, you can specify the constraints and actions in the context of the overall system. They may or may not be implemented as separate components. People play different roles during their lifetime; in a distributed enterprise the same organization may play role of a customer and a supplier, and so on. Object roles allow more stable description of individual business objects and more adaptive object system model: they are able to model real relationships between business objects in multiple applications. Business object may have many roles, which may be added or deleted dynamically. With OBEROn, business processes are modeled dynamically and provided with controls that allow real-time modifications operating at the speed of business requirement changes. Business applications are often very complex and composed of many integrated modules, accessed by a variety of users with different devices. You can have remote users for which access is via internet: for these cases you will need to develop web interfaces; then you can have users inside the corporate network for which it is more convenient to use the desktop clients, portable to the different operating systems. Finally, with the continuos expansion of smartphones and tablets, the mobile access has become a non-negligible requirement that requires the development of special applications compatible with these devices. All these external interfaces of the business system must be developed, mantained and updated and this requires huge economic efforts for companies. One of the main advantage of OBEROn is to concentrate all the business logic in one place and define dynamic client applications that adapt themselves to the logic defined on the server side to manipulate the data/documents and present them to the user. For example, if you add a new property to a business object and you change the input form definition adding a new field to edit the new property you will need only to access the database with the administrative client and perform the changes. After that, all desktop and mobile clients and the web application, will load the new interface giving the faculty to the users to show and insert the value for the new property.